Little Giant 566765 Tuscany Fountain Kit | Fountain City Art Ctr. This Italian-inspired fountain and planter lets you display plants of your choice. 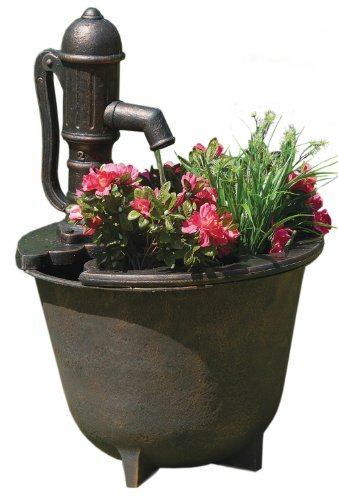 A faux antique iron hand pump pours continuously into the weathered-looking tub. Classical Fountains by Little Giant are an easy, affordable way to enliven your home or garden. These versatile, portable and self-contained water features are easy to assemble and are ready to use in minutes. They bring the soothing sound of water in motion, relaxing energy and old-world charm to your garden, patio, veranda, sitting room, and foyer - just about anywhere inside or outside your home. Classical Fountains are molded of watertight, durable polyethylene and won’t deteriorate like wood or corrode like metallic fountains, providing you years of enjoyment. Classical Fountains water features are produced by Little Giant, and are backed by a 1-Year Warranty. Lightweight, portable, self-contained design. Unique, patent-pending integral planters. Easy to assemble; ready to use in minutes. Rotational molded polyethylene is durable and watertight. Hand-finished, realistic colors and accent designs. UL listed 120 gph utility pump is oil-free and energy efficient. 22" diameter x 32" tall. Copper in color. If, after 30 days, you are having a problem with your Little Giant, Franklin, or Red Lion product, call the Franklin Electric Tech Support Team at 888-956-0000 for Troubleshooting and Warranty Instructions. The Tech Support Team is available M-F from 7:00am-4:30pm CST. Classical Fountains by Little Giant are an easy, affordable way to enliven your home or garden. These versatile, portable and self-contained water features are easy to assemble and are ready to use in minutes. A faux antique iron hand pump pours continuously into the weathered-looking tub. UL listed 120 gph utility pump is oil-free and energy efficient. 22" diameter x 32" tall; Copper in color.